The University of Cincinnati 1946 yearbook. Text bottom right reads, “The war with its hard fought battles and lonely hours is over. Those who left McMicken’s halls to help fight those battles and to share those lonely hours have come back—not only to take up where they left off, but to carry out the dreams and plans they made while they were gone.” “McMicken” refers to McMicken Hall on the University of Cincinnati, Ohio, campus and was a nickname for students used in the 1940s. 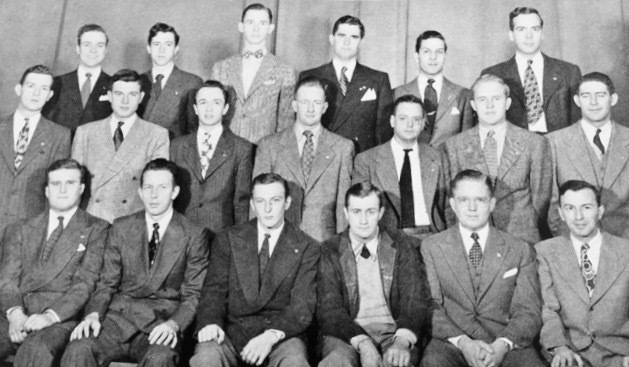 Members of the University of Cincinnati Veterans Association in 1946. Row 1 — Kemeny, J.; Rodgers, J.; Niedenthal, R.; Kelly, R.; Ritter, B.; Armandroff, T. Row 2 — Hannon, J.; Faunteleroy, T.; Cleary, R.; Gordon, R.; Hill, R.; two unidentified members. Row 3 — Vance, E.; Williams, H.; Murphy, J.; Williams, T.; Bentley, E.; Feltrup, A. Robert Kelly was president of the organization. The purpose of the Veterans Association was to promote fellowship among veterans as they entered college life. Before WWII ended the United States (US) Congress passed the Servicemen’s Readjustment Act of 1944 which provided a range of benefits for returning veterans. The legislation is more commonly known still today as the G.I. Bill of Rights. The educational benefits in the G.I. Bill included tuition and living expenses for veterans returning to school. The University of Cincinnati was one of many universities, colleges, trade schools, and training programs that welcomed WWII veterans wanting to continue their post-war education. G.I. Bill enrollments at the University of Cincinnati began in the fall of 1945. At its peak there were 8,000 veterans enrolled there. In 1949 two-thirds of the university graduates were WWII veterans. The G.I. Bill was a defining document in 20th century US history. The positive effects on the US economy that started with the passing of the G.I. Bill are still evident today. The genesis of this story began when I found the 1946 University of Cincinnati yearbook in a used bookstore in San Antonio, Texas. 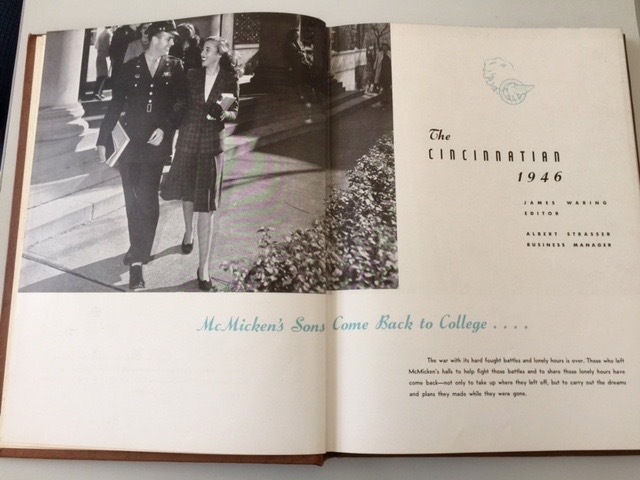 The tone and sentiment in the yearbook reflects the 1940s US society and the educational institutions that welcomed WWII veterans back from a long war and sought to help them readapt to civilian life. Thank you to University of Cincinnati Archivist Kevin Grace for his help in researching this story. Photographs in the story are courtesy of the University of Cincinnati Archives.